3M's announcement in 2000 that it was phasing out its popular Scotchgard product led to a major investigation by the Federal Environmental Protection Agency. The anti-stain spray contained chemicals toxic to lab animals. The chemicals had also turned up in the blood of 3M workers, though the company said its employees were not harmed. On the state level, an investigation by Minnesota Public Radio and American Radio Works found that even after 3M said it would no longer make the chemicals, the Minnesota Pollution Control Agency let two years pass before it began any inquiries. 3M developed the chemicals in Cottage Grove, Minnesota. The MPCA moved into action only after 3M approached it, to say the drinking water at its Cottage Grove chemical plant was contaminated. Over the next two years, the MPCA's top researcher on new chemicals was repeatedly denied the chance to investigate how far the toxins may have spread. The story raises questions about who is responsible for the safety of the public and the environment. And about whether state agencies are doing enough to protect citizens from toxic chemicals. St. Paul, Minn. — On Jan. 25, 2005, Oakdale residents learned their drinking water was contaminated with chemicals formerly made by 3M. At the news conference, health department scientists joined Oakdale's mayor and some of his staff at city hall to get out the word -- tests of six city wells showed that five of them were contaminated. But the amounts of the chemicals –- called PFOA and PFOS -- were small. "Levels found in our local wells do not exceed those health-based values," said Mayor Carmen Sarrack. In other words, Oakdale's water was safe to drink. Prompted by TV reporters, Sarrack dutifully took a drink from the city hall tap in front of the cameras. "This afternoon I went home for lunch and had two glasses of water, and I'm still here," Sarrack said. Oakdale is the second known location in the U.S. where traces of PFOA and PFOS have contaminated a public water supply. Drinking water near a West Virginia chemical plant has also been contaminated. But if you got your blood tested today, it would almost certainly contain traces of both compounds found in Oakdale's water. And you would not be alone. An estimated 95 percent of adults and children in the United States would test positive for perfluorooctanyl sulfonate, known as PFOS, or a related compound, perfluorooctanoic acid, known as PFOA. These chemicals are present around the world, including in the U.S. blood supply, the blood of 3M plant workers, as well as fish, birds and animals living far from chemical factories. Until 2000, 3M was the sole manufacturer of this family of chemicals, which went into Scotchgard. Scotchgard is made from a chemical that breaks down into PFOS. It was primarily made at 3M's plant in Decatur, Alabama. PFOA was produced at 3M's plant in Cottage Grove, Minnesota, and sold to customers like DuPont for use in its Teflon brand of non-stick coatings. Scotchgard is one of 3M's signature products, helping to earn the company millions of dollars and a reputation as one of the most admired companies in America. For more than a century, 3M has been seen as a pillar of Minnesota's business community, and known for corporate good deeds and financial support of nonprofits, including Minnesota Public Radio. Radio legend Arthur Godfrey was full of praise for 3M when he brought his CBS show to Minneapolis in 1969. "You know who they are! 3M, my gosh, is one of the great names in American industry. Kind of like sterling on silver, is the way I like to think of them." Scotchgard started out as a brilliant success story for 3M. It was the result of a lucky accident. The company started a major research effort on something called fluorochemicals in the 1950s. In the lab one day, chemist Patsy Sherman spilled a mixture on a lab assistant's tennis shoe. The stain turned out to be impervious to water, soap and scrubbing. This led to innovative products like marine firefighting foam, food packaging, and most famously, Scotchgard fabric protector, introduced in 1956. Scotchgard was a hit with housewives. In 1969, WCCO radio's Boone and Erickson featured inventor Patsy Sherman for a call-in segment on Scotchgard. "I'd like to ask your guest whether or not Scotchgard is safe to use on items such as silk ties?" asked one female caller. "The spray can product should be safe for any product that is safe in drycleaning," responded Patsy Sherman. "And yes, it will keep the gravy off the tie," because the gravy can't get to the thread. Rich Purdy is a former 3M scientist familiar with the chemicals in Scotchgard. "So if you put it on paper, the grease doesn't soak through the paper. If you put it on fabric, then it doesn't soil as easy. Or you put it on your carpet. Scotchgard or Stainmaster are two brands of carpet treatments that have that property," says Purdy. "It has those wonderful properties. And the other wonderful property of it, it doesn't break down as easy." In fact, scientists say, perfluorochemicals like PFOS and PFOA don't break down at all in the environment. Scientists are still studying how they enter humans, but it's thought to be through air and water. Once the chemicals are in the body, 3M's medical director Dr. Larry Zobel says they hitch a ride with protein in the bloodstream, and circulate through the body. "They're very unlike other materials that get in the body and stay a long time, which might go to fat or to bone. These materials don't. They're actively moving around the body," explains Zobel. "They bind to protein in the blood. The liver removes them and actually excretes them in the bile. So they get into the intestine, and as they're moved down the intestine they are re-absorbed again. So they come back through the circulation back to the liver, they re-attach to protein and they circulate some more." Zobel says PFOS stays in the human body about five years, and PFOA almost four. Scientists say that chemicals that stay in the body or stick around the environment aren't necessarily a problem -- unless they turn out to be toxic. Rich Purdy says when he joined 3M in 1981, it was his job to evaluate the environmental safety of the company's products, including Scotchgard. He says he noticed that the chemical structure of PFOA and PFOS –- carbon attached to fluorine -- was similar to other well-known environmental toxins. "You know about chlorinated chemicals -— the dioxins and DDT and so forth. ... Fluorine belongs to the same —- in the periodic table, it's right next to chlorine. ... And so you would expect that they'd be similar in several properties," says Purdy. "Everyone in my group had concerns about them. ... We didn't have data that showed that they were very toxic or anything, but we looked at it in two ways. One was that you should find out. But the other one is, that even if they aren't, you need to do the testing, because somebody else is going to look at the structure and ask the questions." Purdy says in the 1990s, 3M tested the compounds in lab rats and monkeys, and the chemicals proved toxic. 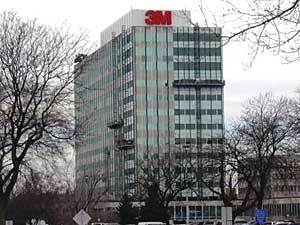 But 3M says the chemicals have not caused health effects in its workers. Michael Santoro, 3M's director of health safety, is working on the corporation's fluorochemical investigation. He says the company began monitoring its chemical plant workers for PFOS in the 1970s. He says the company kept working to improve its detection techniques. In the 1990s, 3M was able to identify the presence of the chemical down to the level of parts per billion. That's a level so small, it's like picking one second out of 32 years. In 1997, a lab comparing 3M workers' blood to randomly chosen Red Cross samples found the chemicals were present in the blood bank samples, too. This indicated the chemicals had become widespread in humans, though at low levels. Santoro says 3M began looking for a safer formulation to replace the old Scotchgard. "There were a number of factors that came together that said to us, 'You know, it seems to us that phasing out here would be the most appropriate thing to do,'" said Santoro. On May 16, 2000, 3M made its announcement. The company's press release said the low levels of chemicals present in humans and the environment did not pose a health risk. Still, the company said it would phase out Scotchgard as a part of responsible environmental management. 3M says the decision cost it $325 million in annual sales. DuPont, 3M's major customer for PFOA, began making the chemical itself. Anyone wanting to make or use PFOS in the U.S. must now get permission from the EPA. In May 2000, when the phaseout was announced, Karen Studders was serving as the commissioner of the Minnesota Pollution Control Agency. She remembers the day she learned 3M would no longer make Scotchgard in its original formulation. "It was either one of two things. It was either 3M actually called the commissioner's office, or one of the senior staff came into the commissioner's office and relayed it to me," says Studders. "So we actually heard about it before it was public. And I believe I saw it in the Star Tribune and the Pioneer Press, a few days later." The story made the front page of the Star Tribune, and the front of the business section of the St. Paul Pioneer Press. After the news broke, Studders said she took no steps on the Scotchgard matter beyond her office. She did not ask for a meeting with 3M. "I don't think I really did, personally. I really think I'd recall that if I'd done that," Studders says. "What I do recall, however, is talking with staff that work on compiling information about new and emerging chemistry and chemicals, and talking to them to see what information we had." Even though 3M cited environmental concerns in its voluntary decision to quit making the chemicals, the MPCA would not begin to investigate the places where the chemicals had been developed and disposed of for another two years. Staff and managers of the MPCA give differing stories explaining that delay. Some say they didn't know anything about this front-page story. Others say they knew about the issue generally, but didn't understand the extent of 3M's chemical production and disposal in Minnesota. The next year, in 2001, 3M again made news when it released a study showing PFOS had been found in the blood of bald eagles in the Great Lakes region, in river otters in the Northwest, in birds and turtles in the Southeast, in polar bears in Alaska -- even in albatrosses in the Pacific Ocean. Michigan State University toxicologist John Giesy did the research, and 3M funded it. He said at the time, his discovery increased the mystery of how these compounds were spreading. "We need more information on some of the toxicology to try to interpret what these levels mean," says Giesy. In the MPCA's "correspondence" file for the 3M Cottage Grove plant, for the year 2001, there is just one piece of paper -- a news report headlined, "Scotchgard sticks in the environment." There were no memos, no studies, no records of communication with 3M. But one scientist at the agency was growing concerned about perfluorinated chemicals -- Fardin Oliaei. Dr. Oliaei is an emerging contaminant coordinator. Her job at the MPCA is to identify new environmental threats -- chemicals that by definition, no one is regulating; chemicals too new to have much of a track record. Oliaei, a native of Iran, is a top research scientist at the MPCA. She was recruited to join the agency in 1989 because of her work on acid rain and dioxins in Lake Superior. Oliaei says perfluorinated chemicals hit her her radar in 2000. "In 2001, PFOS and PFOA were climbing the ladder to become a priority list. In my view I would put those on the top of the emerging contaminants of concern," says Oliaei. Oliaei got the go-ahead from the MPCA to do one study in 2002 on 14 fish in Voyageurs National Park, in northern Minnesota. She wanted independent confirmation of what 3M was finding. She says half the fish samples were contaminated with perfluorinated chemicals. "And we couldn't get to any conclusion, except expanding our data and gathering monitoring data from the environment," Oliaei says. This would be the first independent study to show the chemicals were spreading in the environment in Minnesota. But Oliaei would not get to follow up. Oliaei wanted to trace the contaminants from their source -- most likely 3M -- through wastewater treatment plants, sewage sludge, sediment, and finally to fish and humans. Her requests would be repeatedly denied by MPCA middle managers. In March 2002, 3M called a meeting with the MPCA. 3M reported that drinking water at its Cottage Grove plant, which produced thousands of pounds of PFOA a year, was contaminated with the chemicals. Dave Douglas is the person at the MPCA who knew the most about 3M's Cottage Grove chemical plant. The MPCA had begun work at the plant in 1985 to clean up a small amount of hazardous waste as a part of Minnesota's Superfund cleanup program. Douglas had managed the project since 1987. Douglas was at the 2002 briefing with 3M. "It was basically at that briefing that this whole issue of perfluorochemicals came to my mind, to my attention," says Douglas. 3M also passed on to the MPCA its studies showing the effects of PFOS on pregnant rats and their offspring. An internal memo from the EPA described the death of the rat pups as "unusual." Douglas, who's desribed by Fardin Oliaei as a "morally alert" scientist, was concerned. "From the get-go, here at the first meeting, 3M came in and they started talking about the second generation rat studies, which is troubling, and we all recognized that," says Douglas. "And we're going to ask questions of them about what they know about that, because that gets to the question of whether we have a significant long-term human problem." After the 3M briefing, Douglas began to investigate what was at the Cottage Grove plant and how to clean it up. But the scope would keep growing. It emerged that at least three public landfills in Lake Elmo, Oakdale and Woodbury also contain waste from 3M's perfluorochemical operations. All are surrounded by houses.